No matter where or how far you go, summer is not complete without a baseball game. Our route didn’t pass through Milwaukee, Cleveland, or Chicago, which left Cincinnati as our last chance at a major league game. On StubHub.com we scored some good seats behind 3rd base and prearranged our parking, all at about half price. 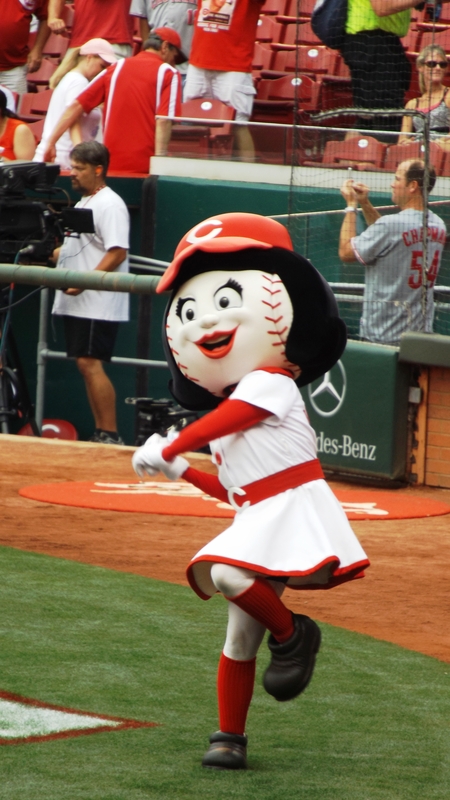 The Reds’ opponent was the Cubs (“Oh snap!” the Dodgers just left town) so we pretty much knew who was going to win. 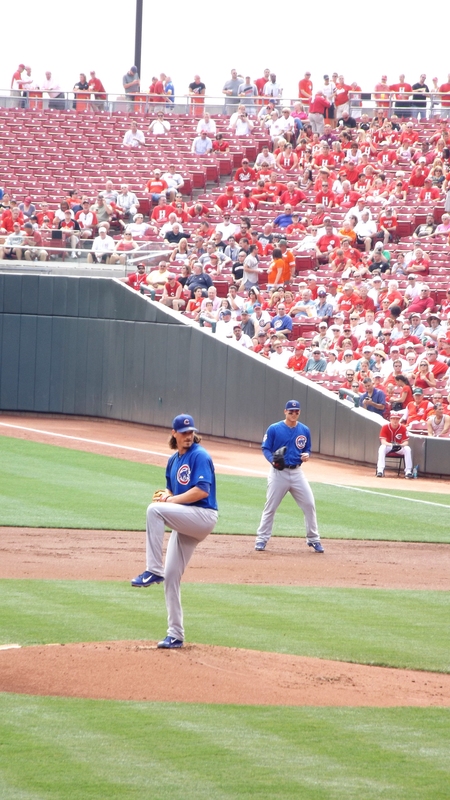 Still, any time you can see a couple dozen millionaires trying to hit a 90 mph fastball, you gotta watch. 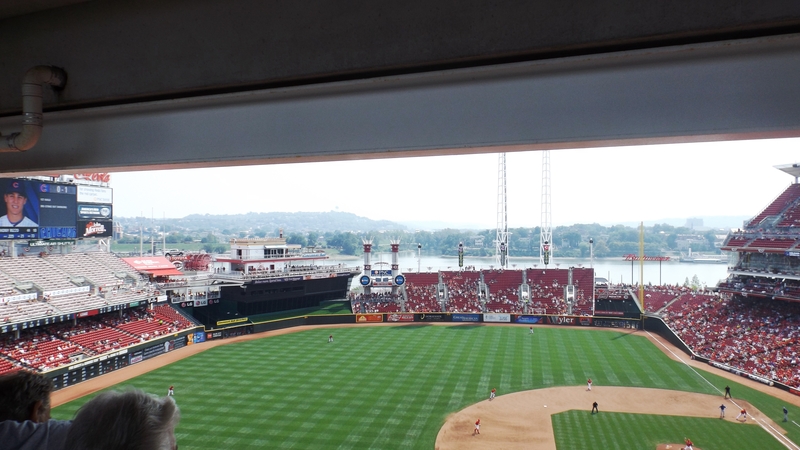 Great American Ballpark opened in 2003. It was built new to look old on the north bank of the Ohio River in downtown Cincinnati, which itself is a lovely blend of new and old. The GAB is steamboat-themed, with modern touches such as great sight-lines, fire blowing out the smokestacks on swinging strikeouts, and toothbrush lights (you have to see ‘em). Their concessions are traditional mid-western fare with Cincy flavor, such as grilled bratwurst and Skyline Coneys, which is a chili dog with cheese. We tried the coney, and loved its peppery chili and half a cup of shredded cheddar. A 12 ounce glass of Michelob Light was $5, and with the heat of the coney was a must. As sports food goes, GAB’s is first rate and reasonably priced. Toothbrush Lights and Fiery Stacks! It was a hot day, 90 degrees in the shade and probably 120 in the sun. 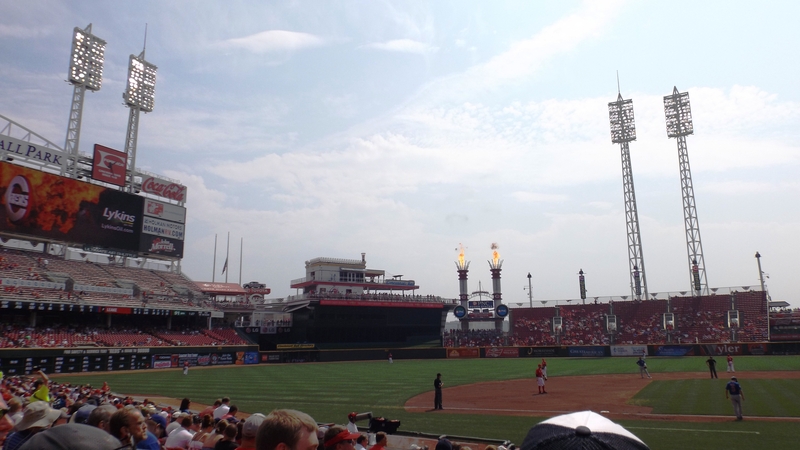 The first three innings were cloudy and pleasant, but then the clouds went AWOL. We lasted one more inning and had to take shelter in the concession area. A young man noticed Kat’s purple and gold LSU golf shirt. He stopped us by pointing to his LSU cap. He was a military brat who had lived in Shreveport while his dad was stationed at Barksdale. This kid now works in Ohio, but can’t bring himself to root for Ohio State or follow the Big Ten. Once a Tiger, always a Tiger! 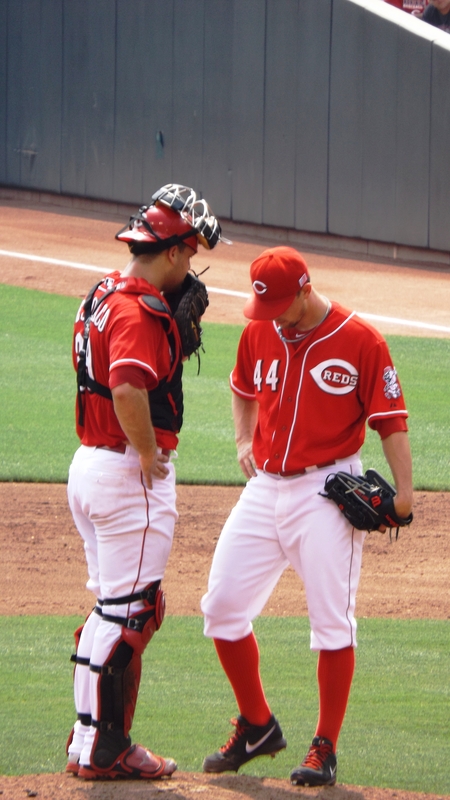 I got a kick out of seeing a couple of my fantasy baseball properties on the field. 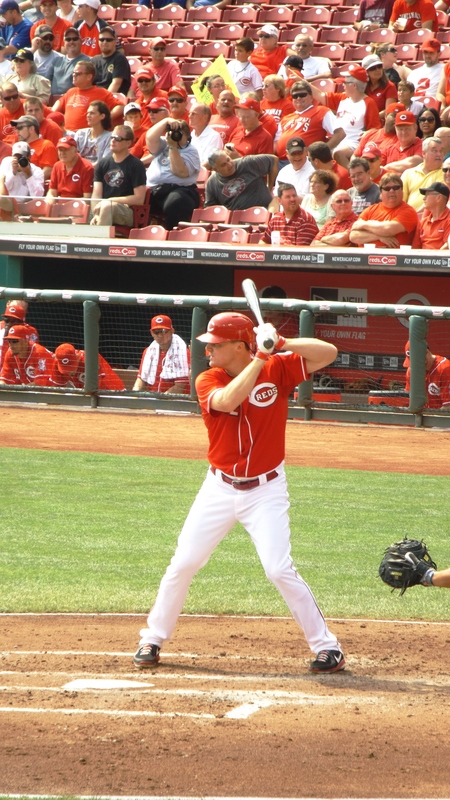 Jay Bruce had a good game but I hated his walk-on music, hip-hop done by a white boy (Sammy Adams, “Blow up”). I don’t have Joey Votto on any of my teams, but next year I’m gonna draft him for his music: “Paint It Black” by the Greatest Rock and Roll Band in the World, The Rolling Stones. The ‘Stones are still performing 50 years after “Satisfaction”. So much for clean living.